Disney Vacation Development, Inc., operators of Disney Vacation Club (DVC) — Disney’s innovative vacation ownership program — announced today that it will expand its timeshare resort presence at the Walt Disney World Resort in Florida (subject to obtaining necessary approvals) by building a seventh DVC property. This latest development for the growing Disney Vacation Club product marks the Company’s largest ownership resort project to date. The announcement heralds a time of exciting growth for Disney Vacation Club, which now boasts a membership of nearly 60,000 member families from over 60 countries. The proposed 600-unit ownership development is slated to occupy a 61-acre site along the award-winning Disney’s Eagle Pines Golf Course at Walt Disney World Resort. All rooms will feature either a pool, golf course or forest view. Initial plans call for the construction of a main Inn building encompassing a check-in area; accommodations; restaurant/lounge; theme pool with feature slide; retail space; arcade; common living room area and a health club, as well as Villa buildings containing vacation home accommodations. Development will begin this fall with an estimated opening in Spring/Summer 2004. The theme of the proposed DVC resort will complement and enhance the beautiful setting found at Disney’s Eagle Pines Golf Course. The new resort will be inspired by the architecture of Addison Mizner, a celebrated early 20th century architect who led the renaissance of Florida resort design. The property’s design will reflect a variety of motifs found in indigenous Florida buildings of this era, including Spanish, Moorish, Romanesque and Gothic forms. The atmosphere and elegance found in the coastal communities of southeast Florida (including West Palm Beach and Boca Raton) will be found in the resort’s architecture, ranging from tile roofs to fountains to lush, tropical landscaping. Commissioned to design the resort was renowned architect Graham Gund, who created the architectural look for such Disney projects as Disney’s Coronado Springs Resort and Disney’s Vero Beach Resort — another Disney Vacation Club property. Gund designed the resort to take advantage of the pristine setting found at Disney’s Eagle Pines Golf Course while maintaining the integrity of the existing golf course. 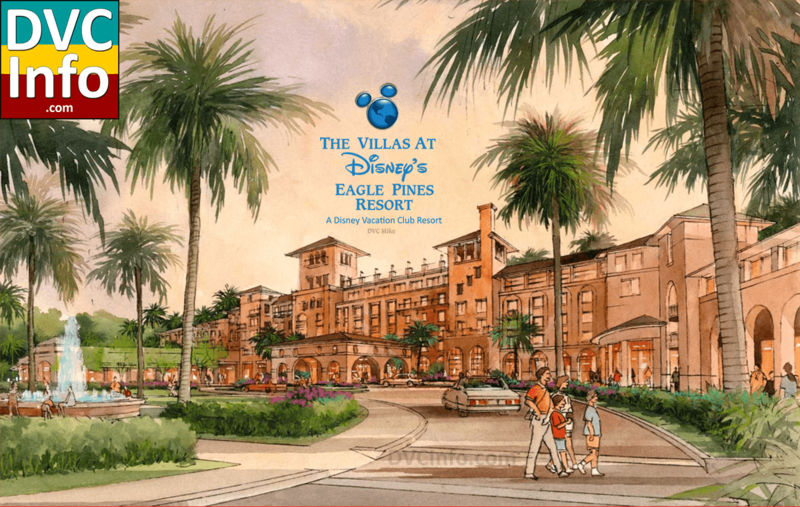 Guests at the resort will have views to Disney’s Eagle Pines Golf Course but golfers’ view of the property will be buffered, with resort buildings “stepping down” in height as they near the golf holes. The new resort is scheduled to open in phases, with the first phase consisting of the Inn building and five Villa buildings for a total of 360 units. The Inn and one Villa building are currently expected to open in Spring/Summer 2004, with the four additional Villa buildings opening throughout the remainder of that year. The final phase of five additional Villa buildings containing 240 units are currently anticipated to open by Spring/Summer 2005. As Disney Vacation Club approaches its decade mark on October 1, 2001, the Company is celebrating a number of achievements, including the expansion of its resort collection through the proposed addition of the new resort at Disney’s Eagle Pines Golf Course and the completion of Disney’s Beach Club Villas, which is currently under construction at Walt Disney World Resort next to the popular Disney’s Beach Club Resort (expected opening in September 2002). “These latest expansions of our successful vacation ownership program will allow us to provide still more magical experiences for our guest and member families,” added Aguel. The current collection of Disney Vacation Club Resorts includes Disney’s Old Key West Resort; Disney’s BoardWalk Villas and The Villas at Disney’s Wilderness Lodge — all located at the Walt Disney World Resort — as well as Disney’s first resorts beyond the Disney theme park locations; Disney’s Vero Beach Resort on Florida’s Atlantic Coast and Disney’s Hilton Head Island Resort in South Carolina. Fast running out of inventory, Disney said Monday it will build a new flagship-style time-share resort between the Magic Kingdom and Downtown Disney. The 600-unit resort, which has not been named, will be Disney’s first full-scale time-share offering since its Old Key West Resort sold out in late 2000. 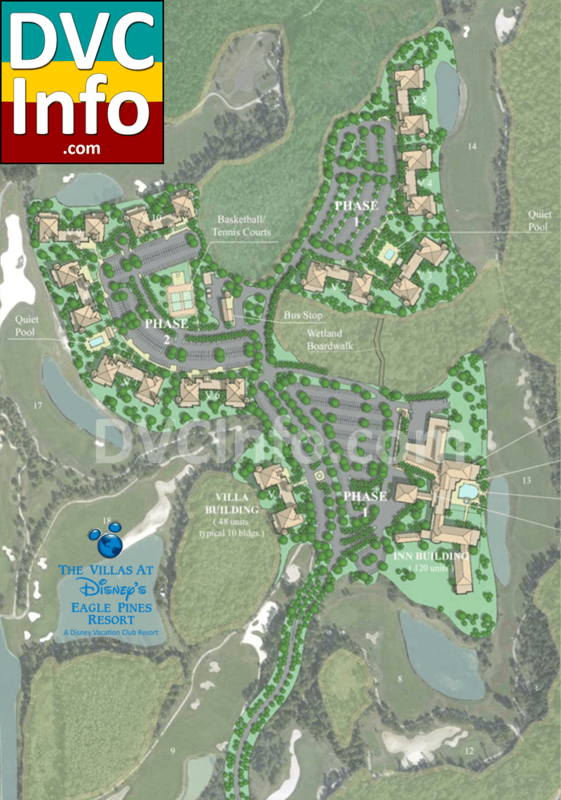 The new resort will sit on 61 acres adjacent to Disney’s Eagle Pines Golf Course. As with other time-share projects, this one will be built in phases, beginning with six buildings and 360 units. The first two buildings will open in mid-2004, followed by the others throughout the year. Taking its theme from Florida’s history, the property will feature tropical landscaping and architecture with Spanish, Moorish and Gothic influences. “It adds a different flavor, a different atmosphere to our portfolio,” said Mariska Elia, spokeswoman for Disney Vacation Club, the company’s time-share arm. This will be Disney’s seventh time share — giving the company 2,100 units at completion — but it will be the second local property that functions as a stand-alone resort. The others, including The Villas at Disney’s Wilderness Lodge, are smaller resorts that share amenities and facilities with Disney hotels. The Wilderness Lodge property and Disney’s Beach Club Villas — a smaller resort now under construction — are expected to be sold out around the time this newest resort opens. “We really need a big project,” Elia said. “This is another anchor property with a lot of inventory.” Disney also owns two resorts outside of Orlando: Disney’s Vero Beach Resort and Disney’s Hilton Head Island Resort in South Carolina. Here is a view of Disney’s Golden Oak and the Four Seasons resort. I outlined in red the location of where the Eagle Pines DVC resort was planned to be built. October 7, 1991 – DVC Preview Center opens to the public, MS begins accepting reservations, first 5 information kiosks open. June 1992 – Select WDW resort exchanges added as options. January 1993 – DLR and DLP resort options added as options. November 1993 – 1st international member event held in London. June 1994 – All planned phases of the Disney Vacation Club Resort completed and opened to members and guests. March 1995 – 150 point Vacation Point Membership package introduced. HH preview center opens. April 1995 – Adventure Travel and Cruise Member Getaways exchange programs debut. October 1995 – VB opens, number of member families: 16,000. Disney Vacation Club Resort officially renamed Disney’s Old Key West Resort. January 1996 – Disney Discovery Club (2Dc) launches as an edu-taining experience for children at DVC reorts. November 1996 – Concierge Collection is added to member getaway program. June 1997 – DCL added as vacaton exchange option. June 1998 – Shadow the dog is introduced at HH. April 15, 1999 – Ground breaking for VWL. November 1999 – Final 3 bulidings at OKW open for members and guests. July 2001 – BWV celebrates 5th Anniversary. 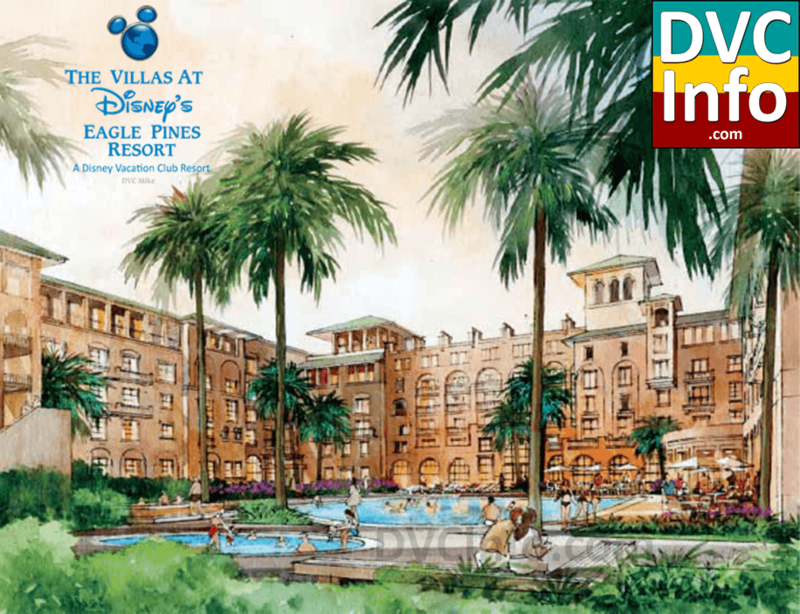 DVC announces plans for 600 unit propossed resort at Eagles Pines Golf Course. 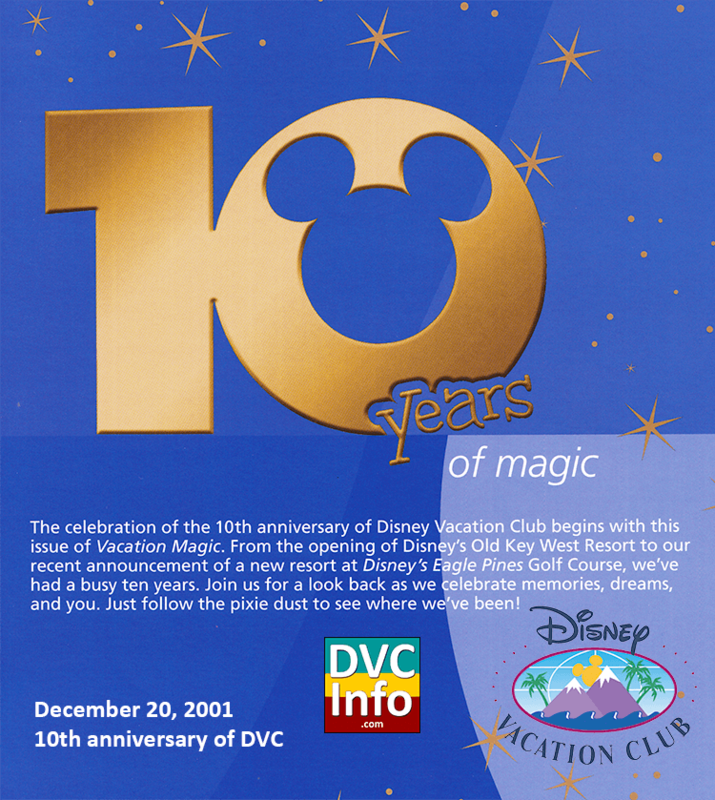 October 2001 – DVC celebrates 10 Years of Memories, Dreams and You! December 20, 2001 – OKW celebrates 10th Anniversary.